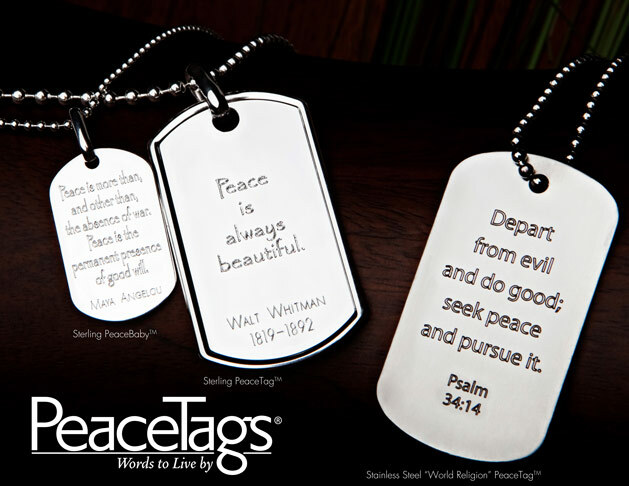 PeaceTags™: Dog Tags with peace quotes to support troops and spread peace; the perfect gift! PeaceTags™ are Gifts that Give Back! PeaceTags™ reflect words of peacemakers and inspire us to work for peace! These dog-tags, inscribed with words of peace, are more than a fashion accessory. They help to compassionately heal the wounds of war and ignite peace in our world! PeaceTags™ are “dog- tag” shaped necklaces that raise awareness and funds for Non-Profit organizations working to heal wounded troops, their families, our communities and our world. PeaceTags promote the idea that we CAN heal the wounds of war AND create a culture of peace. In these complex and challenging times, wearing a PeaceTag provides a way to share the voices of some of our wisest sages and creative thinkers calling us toward peace! Our sales support a variety of 501c3 non-profits. PeaceTags are exclusively available through Alvin Goldfarb Jeweler.